Reclaimed wood Jewelry organizer. 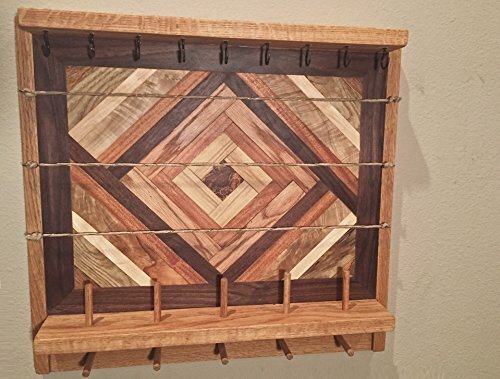 Wall hanger for earrings/bracelets/necklaces. Dimensions 19.5"W x 16"L x 5D. This Wall Hanging Jewelry Organizer & Shelf is the perfect way to keep all your favorite jewelry organized and easy to get to. It not only allows you to neatly arrange all your jewelry, but is an eye-catcher up on the wall! hangers are installed on the back which allows the frame to hang securely from the wall. Features: - Bracelet Pegs - Shelf - Earring Organizer Display - Long necklace knobs All of our items are handmade in the USA. If you do not see a feature you want please contact us for custom pricing. Every pattern is different please check our other items in our shop for more variations. If you have any questions about this product by Southern Charm Woodworks, contact us by completing and submitting the form below. If you are looking for a specif part number, please include it with your message.